Sunshine Through the Rain: A Practical Project and a Giveaway! My youngest saw me looking at a fantastic bunk-bed tidy on the Sew Scrumptious blog about a month ago, and declared that this was exactly what he needed! I finally got around to making it this week. I had found some brilliant Tintin sheeting fabric at our local market and had made bed covers for the boys with it. I used the left-over fabric to make the pockets, and two layers of the calico to make the main section. My big delay was finding out what the Indonesian word for velcro was! Once I had that sorted I went back to the market and bought 2 meters of it for 80 cents! This came together really easily and my son loves it! On another note, my little blog reached 50 followers last week, and so to celebrate and to thank so many of you for supporting me, I thought I'd have a giveaway. I just love the quilting community and I love that I've made some great friends through it. I really enjoy reading so many of your blogs and I have been the lucky recipient of quite a few giveaways. So this is my thankyou to all of you. I found these Japanese cottons (all half-meters) and these pretty ribbons at the fabric market. There will be two winners. 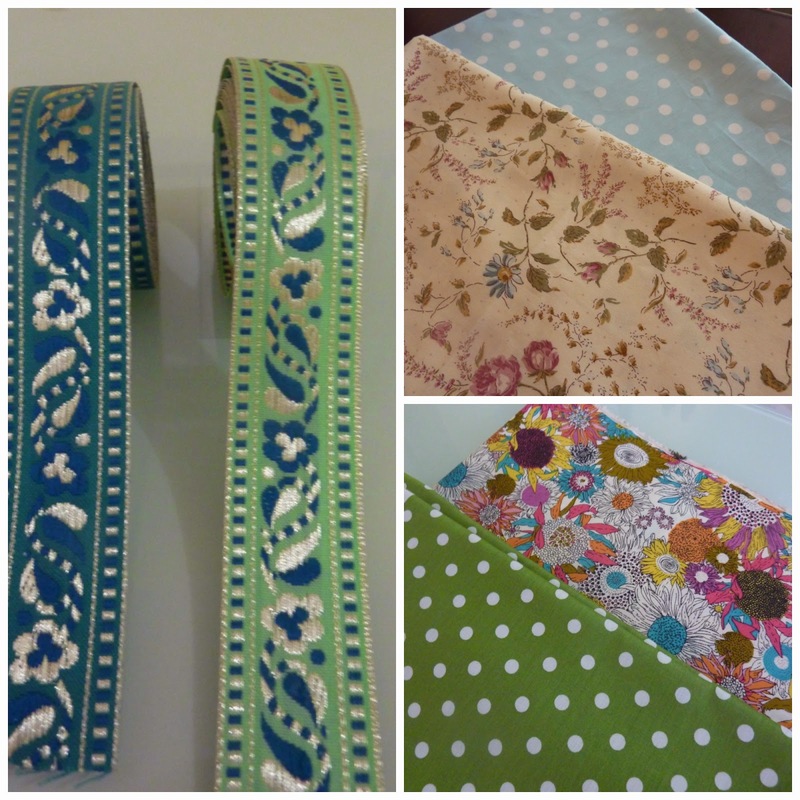 One person will win this pretty floral design, the blue dots and the green ribbon. To enter just leave a comment (if you like you can tell which one you would like if you won)! I will draw the winner on Thursday morning, Indonesian time. Deborah, lovely prizes! Thanks for the chance to win some goodies from overseas! Wow! That sunflower floral is amazing! What a great find. Your bunk tidy looks like such a useful project to make. I had a bunk bed first semester at University and I hated getting down off the top bunk just to get small things that I needed (like books or my i-pod). I'm sure the Tintin fabric makes it extra cool for your boys too. I especially like your photo of all the stuffed animals poking their heads out of the pocket. :) Congrats on this fun milestone! That is such a cool idea for bunk beds! Beautiful giveaway Deb, that liberty print is just stunning. Love the bed tidy! It looks great. The giveaway items are so cute, but don't enter me, as you know I have been spoilt rotten lately! Brilliant idea for bunk beds. Wish I'd known about that when mine were young. Thanks for the wonderful giveaway. I am sneaking a look at this in the hope that my children don't spy Tintin! It is so awesome and they would be begging me for the same, they read Tintin books over and over and play it too, with my 4 yr old as Snowy! Love that Liberty print. 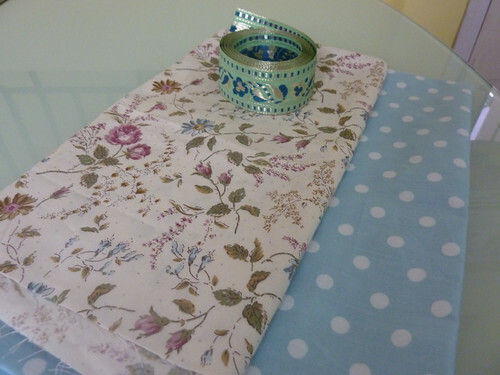 Great tidy, the Tintin fabric was an excellent find and your giveaway fabrics look lovely too. Congratulations on 50 followers too! Congrats on 50 followers! The bunk bed tidy is so cute!! The bunk tidy is a great idea! My eldest needs that too :) congrats on 50 followers! 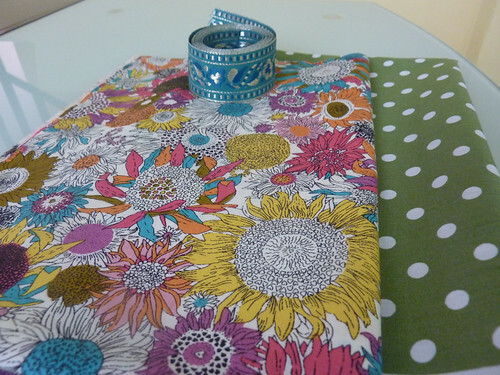 You know I love following along on instagram :) I must say I love the second bundle, that liberty print is gorgeous! I love the second one...it is so bright and cheerful! I love your bunk tidy. Wish I had known about that YEARS ago when my son was young, lol. Thanks for the chance to win! Great idea! I always felt like the guy in the top bunk was left out of accessible storage. Thank you so much for linking up to SEWjo Saturday! 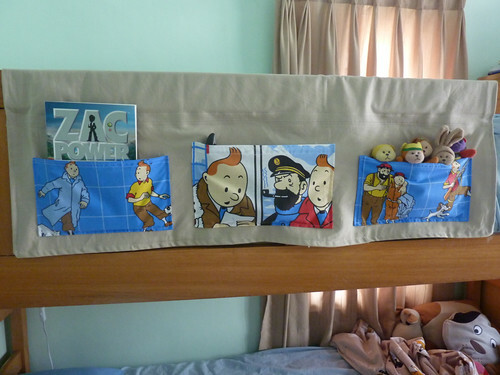 That Bunk Bed tidy is the best idea and I love the Tin Tin fabric, I was such a huge Tin Tin fan when I was young. Congratulations on reaching 50 followers!! Such a great giveaway, the ribbons are gorgeous and I love the sunflower Liberty print. I thought I had commented on this post- l(ooks like my iphone swallowed it!) What a clever idea that bunk bed tidy is!! Thanks for the great giveaway- I'd love to own either of these, although the Sunflower Liberty is a particular favourite of mine! Great organizer Deborah! The fabric makes it perfect for a boy's bed. Congratulations on reaching 50 followers tha's awesone! Thank you for a generous giveaway. Ooooh, I need that sunflower print! What is it?! I love tintin! Great idea. You junior has good taste :-). And congrats on your first 50! Your bunk bed tidy is brilliant. 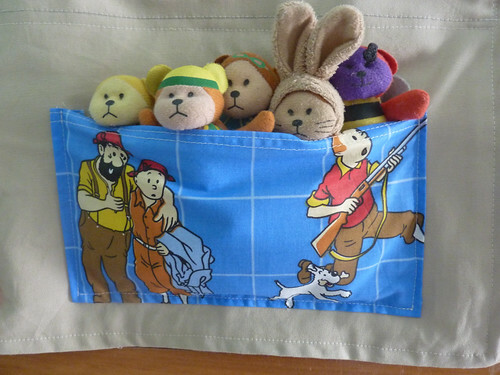 Love how you've used the Tintin fabric! Congratulations! Love both giveaway prizes! A Fabric Market, really, awesome! Love the idea of the bunkbed organizer, we really need to get a bunkbed, my daughter is getting to tall for her crib. I like the sunflower print, love the blue dots and green ribbon, so either would be really awesome. That tin tin fabric is great. My husband would go crazy for that! In fact I think he'd love to have some bed sheets and a bed tidy made with it! Hehe! What a great project, Deborah! I think it's especially wonderful that your son wanted you to sew something special for him. It turned out really cute!!! Those little stuffed animals are so cute peeking out. Congratulations on all your giveaway wins lately and your new followers--you have a beautiful blog! That bunk bed tidy is brilliant! It makes me wish the boys still had bunk beds, although I always hated making the top one!!! Congratulations on reaching 50! You may have more than you think as I usually find you via Le Challenge. Love the Tintin too, blistering blue barnacles what a great idea! What a wonderful giveaway. I like the floral. I love the latest project. Congrats on 50 followers. 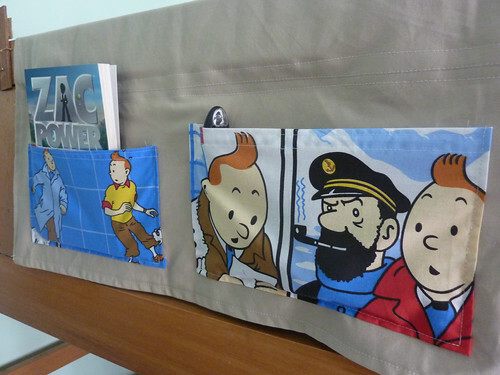 The Tintin fabric is brilliant, such a useful project too. I don't think I'll show it to our three top bunk sleepers for they may each want one! Congrats on reaching 50+ followers. You have some lovely goodies there from your fabric market. The second bundle appeals to me a little more.